This is the time of year when I start to futz around with "which skis should I use" and looking for ways avoid dragging the old, slow, no-wax cross-country skis out of the basement. The annual, seasonal ski problem I have is how to avoid using klister wax. Once the snow gets a little wet, then freezes again, using kick wax becomes a challenge. No-wax skis are fine for climbing in these conditions, but the down hills are not as much fun for someone who likes to go fast and enjoys quiet time on the trails. They are slow and noisy. Since people have used cross-country skis since forever, we know there had to be a way they got a little purchase before the advent of fish scale plastic. Ancient man (the scientific "man") used pine sap on the bottom of his wooden skis in order to stay on top of the snow and still move forward. Which, of course, we know he did. Unfortunately, the tools relating to cross-country skiing have not moved forward much since that time. Ski wax manufacturers actually make klister; a sticky, gooey, pine-sap-like goo, sold in a tube for application to the bottom of a ski in spring conditions. Even when I get it on my ski, it doesn't work. But usually it ends up everywhere but on the ski: hair, hat, glasses, mittens, electronics, etc. So I avoid using it. The only other option, except for climbing skins for steeps, used to be no-wax skis. Finally, we've entered the 'magic' technology stage for x-c skiing. This past weekend, the resident ski tech and biologist picked up some magic tape that goes on the bottom of cross-country skis and acts like kick wax, but with a range from -4 to +40 degrees. It works! It looks a lot like kick wax. The guys at the ski shop say you can get 120 miles of x-c skiing out of one application. My friend used this for the Loppet and had a great race, whereas I lost kick at about 13k using hard wax. The cruel irony of springtime for nordic skiers used to be sweet-skiing corn snow is tough to wax for. The magic tape changed all that. I had two days of excellent skiing in spring conditions. I made up the part about ancient ski man's use of pine sap for ski wax. But, it makes sense and I bet if one had time to thoroughly research the topic, it would pan out. 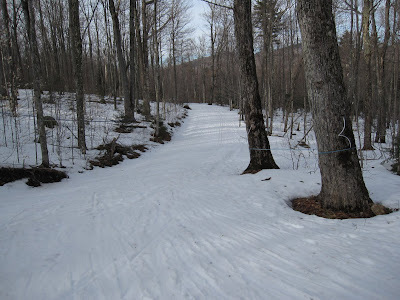 Today's featured photo is Mount Van Hoevenberg's cross-country trails in corn snow.